This report presents some results of the REMOWE project and sets guidelines for regional policy makers, SME's and the general public as well for more deep realization of waste-to-energy policy principles in action. The overall objective of the project is, on regional levels, to contribute to a decreased negative effect on the environment by reduction of carbon dioxide emission by creating a balance between energy consumption and sustainable use of renewable energy sources (waste-to-energy cycle). Reduction of carbon dioxide emissions and use of renewable energy sources are broad areas and this project will focus on energy resources from waste and actions to facilitate implementation of energy efficient technology in the Baltic Sea region within the waste-to-energy area. The focus is to utilise waste from cities, farming and industry for energy purposes in an efficient way. The project seeks to facilitate the implementation of sustainable systems for waste-to-energy in the Baltic Sea region and specifically, in a first step, in the project partner regions. The project's duration is 12/2009-12/2012. This report is structured into 8 chapters, which are further divided into subchapters if needed. Relevant data about current situation about waste generation and management in partner regions of REMOWE project are described in Chapter 1. There are guidelines on action plan and strategies for regional policy makers, SME's and the general public to mobilize waste to energy production in Chapter 2. Beside guidelines, this report contains references to basic political acts of waste and energy management of EU and best practices of implementation them in regional level (Chapter 3). The focus of Chapters 4 and 5 is on energetic potential of waste and technologies for utilisation of waste for energy purposes. During the project period in each of partner region innovation processes were realised and innovation ides evaluated, basic results are collected into Chapter 6. 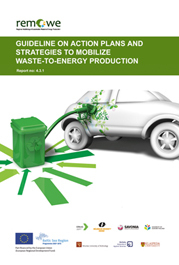 Chapter 7 gives some challenging ideas for use of waste energy in pwer and heat as well as for transportation. Innovative approaches for effective information delivery and involvement of public are analysed in Chapter 8.